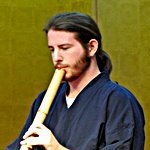 my name is simon and ive been learning the shakuhachi for approx 1 year now (on and off). i dont have a teacher,but im more than happy to learn from books. i thought id join a forum as i have a few questions about obtaining books for shakuhachi (mainly score books). i have also played the guitar for approx 25 years. my introduction to the shakuhachi was by accident and since then ive been hooked by the sound.i love it. im a jujitsu instructor but also study ninjutsu,it was while i was looking at different strategies employed by the ninja such as disguising themselves to travel freely (komuso monks) that i learnt about the shakuhachi....and ive never looked back since, a most enjoyable and rewarding hobby. Hello rotsurechihai! Love your "name". Looking forward to hear more from you and perhaps also more about your jujitsu, ninjutsu activities! well... just that I myself have no clue what jujiteu or nunjutsu is... and have been curious for a while. It seems others combine shakuhachi playing with for example ninjutsu. It could be nice to hear how people feel they supplement each other... if they do. the shakuhachi is an instrument that is very common ( or at least a flute) but when i looked into how a shinobi may travel easily without being seen and what they could carry as part of an arsenal then i came across the kumoso monks and the shakuhachi. small stick techniques for defending and restraining are very common (they also have many names such as jo/yawara/hanbo etc) and i was building up a set of weapons that when i was teaching ninjutsu,i could use to show students "hidden" weapons,such as a fan,a rope belt,long bamboo flute and such. no shakuhachi has actually been used in my classes though,there too expensive to use as batons lol.instead i prefer to learn to play it,its actually taken over my guitar. hope this makes things clearer for you. Welcome to the forum! It's always good to hear about other martial artists/shakuhachi players. Aside from me, there are a few of us on here, Mischa being one. When I lived in Japan I asked my koryu jujutsu teacher about shakuhachi as a weapon. I found a piece of bamboo that I and my shakuhachi sensei had harvested the previous year but somehow never managed to be made into a proper flute. Anyway I took that with me to his dojo and I have a video somewhere of me being subjected to some pretty serious pain and being thrown around by a 60 year old man, who, once he'd subdued me, put the flute to his mouth and walked away playing it. "This would be a good weapon. However it might affect the sound if you hit someone with it..."
Incidentally, what's your ryuha Roturechihai? Can I infer that you're up over the border from that video you posted? Seems there are a couple of you appearing up in Scotland now! i come from lancashire. we teach all over the place and do demo's. the video was of a charity "do" that we did. If you can ever make it to the London shakuhachi summer schools I'd definitely recommend it, while you may not want to learn from a teacher it is a wonderful atmosphere and great to be surrounded by fellow enthusiasts! I'd definitely recommend visiting Japan to train, though be prepared for a lot of people not to understand what jujutsu is! Be prepared for that to happen in Japan too!